Barium swallows are used nowadays to assess the functional anatomy of the upper GI tract, but the procedure requires the use of harmful X-rays and a clinician to interpret the images. The important aspect of patients with dysphagia is whether a patient is breathing in some of the food and liquids during swallows, or simply has an uncomfortable sensation from other causes. 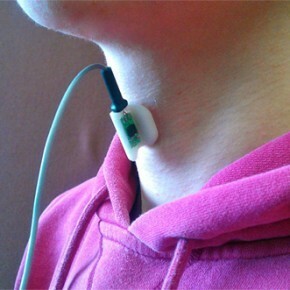 In order to be able to detect these micro aspirations in an ionization-free manner, a team from the University of Pittsburgh are using a sensor that sticks to the skin over a patient’s Adam’s apple. Dual-axis accelerometers within the sensor record the movement of the Adam’s apple during swallows.